This photo is on the Staffordshire Past Track website, where it is described as: “Fogg cottages at Amington”. “Fogg” with two “g’s”. Robin Mathams, who is researching the Trent Valley Railway and gave talks at last year’s Crewe Lunch and this year’s Open Meeting at Kidderminster on the subject, says he has checked and it is not at Amington. From old Ordnance Survey 6-inch maps and recent satellite imagery, this block of four LNWR cottages certainly looks like the building described as "Fog Cottages" at Amington, parallel to and just in front of the main line. The photograph seems to have been taken from the Old Tamworth Road bridge over the canal, looking north. How many sets of Fog Cottages were there on the LNWR? The photo was taken from Coventry Canal bridge No. 65 looking north-east and the view today is completely obscured by trees and a block of flats called Langside Court. They are also almost completely obscured from the nearby railway bridge. Surprsingly, the Fog Cottages only have footpath access. 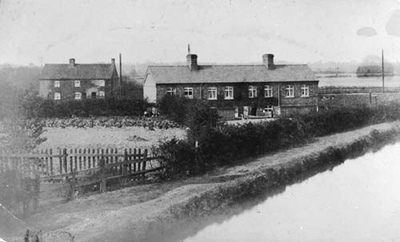 The cottages are Webb Type 1a as classified by the LNWRS Company Houses Journal and the railway ran between them and the house on the left, the railway land in between being just wide enough to take the additional two lines when 4- tracked. From the foreshortening of the camera lens, you could be forgiven for thinking there was no space for a railway between the two buildings. The house on the left pre-dates the building of the railway (1847) as it is marked on the Parliamentary Plan whereas the Fog Cottages were built after 1883-4. The other house was still on the O/S 6in map of 1938 as outlined by Harry and when it was demolished is not known, but because it was now very close to the widened railway, I would think vibration from passing trains on the up slow line may have had a bearing on the matter! The expanse of water on the right is a field flooded by the nearby River Anker - it still floods today. Curiously, the Fog Cottages are numbered 2 to 5 � there is no No.1 - and when we asked the elderly ladies who live in No. 5 about this, they didn�t know. We thought it may be possible No.1 was the now-demolished house on the other side of the railway, but if not, No.1 remains a mystery. As far as we know, there are only 3 sets of Fog Cottages on the Trent Valley line, at Cathiron, Amington and Rugeley.